“The Peasant Novel” by Valerie Kaussen, Ph.D.
"The Peasant Novel" by Valerie Kaussen, Ph.D.
Kaussen is Associate Professor of French at the University of Missouri in Columbia. She is the author of Migrant Revolutions: Haitian Literature, U.S. Imperialism, and Globalization (2008). The peasant novel is certainly Haiti's most resilient, and discussed literary genre. The first novels to treat the Haitian peasant milieu appear in the early twentieth century. Novels like Justin Lhérisson's La Famille des Pitites-Cailles (1905) and Antoine Innocent's Mimola (1906) depict, often with ethnographic precision, Haitian peasant culture—cockfights, coumbites (rural work collectives), and especially, vaudou ritual. The peasant novel, though, comes into its own during the teens, twenties, and thirties, and is associated with the indigenist movement, a literary prise-de-conscience that called for an aesthetic exploration of Haitian "authenticity" and national specificity. Such Haitian cultural nationalism was a response to the racism and neo-colonialism of the United States occupation: it sought to preserve and record a culture that was seen as threatened by a post-Spanish CivilWar regional order dominated by "yankee" imperialism. Haitian writers associated with the indigenist movement were deeply influenced by the diplomat, nationalist, and ethnographer Jean Price-Mars, who wrote prefaces to at least two important Haitian peasant novels of the period, Jacques Roumain's La Montagne ensorcelée (1931) and Jean-Baptiste Cinéas's Le Drame de la terre (1933). Young Haitian writers of the educated elite (like Roumain and Cinéas) sought to resist what Price-Mars termed the "bovaryisme collectif" of their parents' generation—a desire for anything foreign and especially French—by turning instead to the peasantry as a source for Haiti's true national identity. That identity was African, a heritage traditionally denigrated by the Haitian elite, who distanced themselves from those who seemed to embody it, the rural black majority. 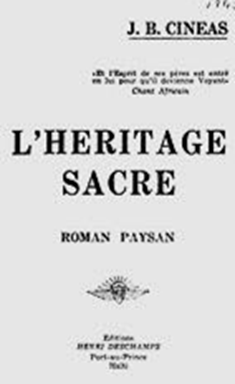 As suggested by the popularity of Price-Mars's compendium of ethnography, history, and folklore Ainsi parla l'oncle (So Spoke the Uncle) (1928), ethnography remained a crucial intertext for the peasant novel, and many writers who treated peasant themes—like Cinéas, Roumain, and Pétion Savain—were either lay or professional ethnographers. Nonetheless, writers of peasant novels were ambivalent about many aspects of the culture that they depicted, especially vaudou. Indeed, the Haitian peasantry had been isolated and exploited for over a century, victims of a kind of unofficial apartheid on the part of the Haitian state, and the racialized ideologies that justified such treatment died hard. Cinéas's Le Drame de la terre is fairly typical in this respect. It tells a story of two houngans (vaudou priests), Frè Dubré and Mapou Laloi, whose rivalry turns from playful to serious when a desirable young woman of the village chooses as her lover Frè Dubrè's son over Mapou Laloi's, causing the latter to plot and carry out the former's bloody death. Cinéas's tale is in some sense an excuse to represent the customs and the environment of the Haitian peasant, while at the same time, suggesting with a considerable dose of paternalism that the intertwined tendency towards violence and superstition, along with droughts and disease, were chief sources of the peasantry's misery. Similarly, in his first novel La Montagne ensorcelée, Roumain depicts the double murder of a mother and daughter as motivated by a village's misery and superstition. 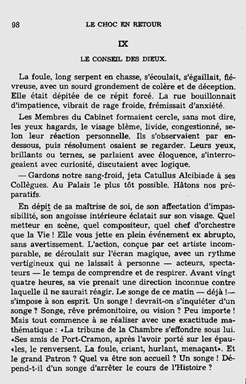 While Roumain shows more social conscience than Cinéas, he argues explicitly that vaudou would disappear with the modernization and development of the countryside. It is a message that he presents even more emphatically in what many consider to be his masterpiece and the most famous Haitian peasant novel of all time, Gouverneurs de la rosée (Masters of the Dew) (1944). In this novel, Manuel, a migrant cane-cutter, returns to his village natal from Cuba, where he has imbibed Marxist doctrine. Seeking to educate his fellow villagers separated by a decades-old feud, Manuel tries to reconcile the community through the collective labor of digging a canal to end the drought that afflicts them. Linking the "blood feud" to vaudou practice, Manuel urges the peasants to triumph over the superstition and ancestral conflicts that keep them locked in the past. Archaic rivalries emerge, though, and Manuel is killed. On his death-bed, Manuel requests that his own murder go unpunished: the sacrifice of a man, he insists, would be more powerful than that of chickens and goats. Manuel's "sacrifice" works, and the novel ends with the peasants reunited in the labor of bringing water to their parched lands. The peasant novel is not without its critics, who have listed paternalism, race essentialism, and sexism among its blind spots. Indeed, the only peasant novel written by a woman—Fond des Nègres (1960) by Marie Chauvet—is also one of the least discussed. 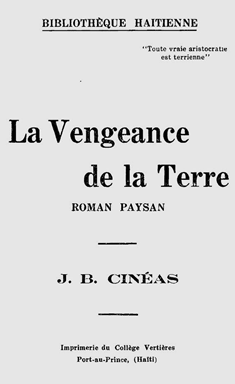 Rather than documenting the customs and environment of the Haitian peasant class, the peasant novel could be said to in fact offer a more subtle and valuable portrait: that of the relationship between what Price-Mars called Haiti's "two nations," the French-speaking, Catholic elite vs. the Kreyòl speaking, vaudou-practicing rural majority.